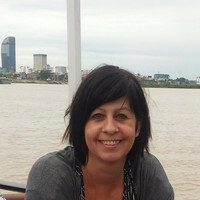 Daniela is our Destination Expert in Cambodia. "I would like to thank you for this wonderful trip, it was just amazing! Starting with the warm gree...". "Daniela was perfect in all phase of the trip. From the preparation and then in Cambogia. Reply to qu...". "This service of all The help hosts and guides were great. I could not have asked more personalize se...". Welcome to Cambodia, located in the heart of South East Asia. In seven days get to know the magnificent and turbulent history of a country rich in culture. Cambodia is also home to some of the most impressive temples in the region. Start your journey in Phnom Penh, Cambodia’s capital city. Learn about the brutal history of the Pol Pot regime and the suffering of the Cambodian people. Balance your stay with a visit to the Royal Palace. 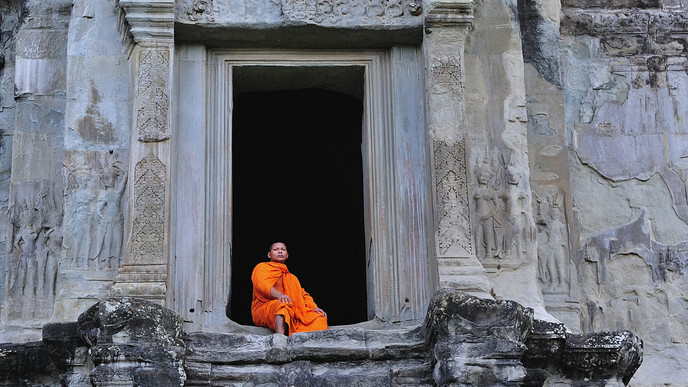 On your way to Siem Reap, visit the oldest temple in Cambodia. Have the chance to explore some of the country's fabulous markets as well as the floating village of Kampong Kleang. Of course, no visit to Cambodia would be complete without a trip to Angkor Wat, a UNESCO World Heritage Site and the largest temple in the world! Welcome to Phnom Penh, Cambodia's bustling capital! Phnom Penh is Cambodia's cultural, industrial and political center and welcomes visitors from around the globe. After you've landed at the airport you will be greeted by a member of our staff and taken to your hotel. Spend the rest of the day relaxing after your long flight. Hang out at your hotel and take a dip in the pool or peek out the door and see what the neighborhood has to offer. Today you will get acquainted with Cambodia’s fascinating and turbulent history as you explore Phnom Penh. Hop into your tuk-tuk, which will take you around the city. Your first stop of the day is at S21 Tuol Sleng. Today a genocide museum, this building was used during the infamous Pol Pot regime between 1975 and 1975 as a prison for the detainment, interrogation, and torture of political prisoners. Afterwards, head to the Royal Palace, the residence of the King of Cambodia and featuring stunning Khmer architecture. Your last stop of the day is outside the city to Choeung Ek, commonly known as the Killing Fields. Learn about the gruesome history behind the place where thousands were brought from Tuol Sleng and murdered before being buried in mass graves. On the way back to town, lighten the mood with a stop at a local market. After breakfast your private car will be waiting to take you to Siem Reap, the gateway to Angkor. En route, stop at Sambor Prei Kuk, a pre-Angkorian temple complex and the oldest temple in Cambodia. 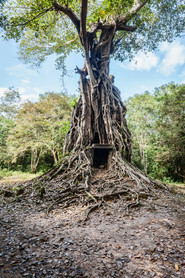 Situated in the forests of Kampong Thom, the temple dates back to the 6th and 7th centuries. Ride a bike through the temple complex and take a closer look at the three main temples in the company of your local guide. As you ride through the jungle, be sure to look closely at your surroundings - overgrown temples can be seen hidden beneath the wild greenery. Continue your journey to Siem Reap, where you will arrive in the late afternoon. Spend the rest of the evening relaxing in your hotel after this exciting trip. Enjoy a delicious breakfast at the hotel, then you are picked up to explore the world-famous Angkor Wat temple complex - on a tuk-tuk! Ride the three-wheeled Asian motorcycle taxi to the temples, where you get off to explore one of the most important and impressive temples in the complex. Before moving on, enjoy a fresh coconut. Then hop back on the tuk-tuk and head for Angkor Thom, another breathtaking temple complex nearby. One of the main attractions here are the 54 four-headed Buddha statues. In the afternoon, visit the Ta Phrom temple, which you might know from the Tomb Raider movie with Angelina Jolie. It is one of the only temples in the region that have been kept in its original, overgrown state. Explore this magical place, that is partly overgrown with gigantic roots and trees, lending the temple a fairytale-like atmosphere. Leave town early in the morning for a day full of adventure. Take a bike ride through Cambodia's beautiful countryside and stop at a fish market in a small village. Observe how the locals trade their goods, a real unique experience! In the afternoon, drive to visit the Kampong Kleang, one of the most impressive floating villages in Cambodia. Board a boat to explore the village in detail, and don't miss the chance to have lunch with the friendly locals in a stilt house. After lunch, move on to the Vietnamese part of the floating village. Unlike in the rest of the village, the houses here are not built on stilts but are themselves floating. As the day draws to a close, return to your hotel in Siem Reap for a relaxing evening and a good night's sleep. Today you have the entire day to yourself. You can use the time to do whatever you wish. Do you feel like visiting more temples? There are many more to choose from. Or maybe you are interested in a cooking class to learn how to bring the taste of Cambodia back home with you? Or how about renting a bike and exploring the town on your own pace. If you feel like relaxing, a visit to a local spa and a wonderful massage might be perfect for you. Just choose what you feel like doing! Your last day in Cambodia has arrived. There are only so many things you can see in 7 days, but Cambodia will always welcome you back for another visit and without a doubt, it will fascinate you again and again. Your driver will transfer you to the airport in time for your flight back home. Have a safe trip!